by John Francis Burke, translated into Spanish by Marco Batta. Liturgical Press (Collegeville, Minnesota, 2016). Much of the story of the Catholic Church in the United States can be told by focusing on how immigrant groups have been received by the church — whether well or poorly — and how these groups have changed the church. This story continues today with the continual influx of immigrants from Spanish-speaking countries, Africa, Asia and the Pacific Islands. The story of the church’s future will be written by how these groups are received in the coming years. 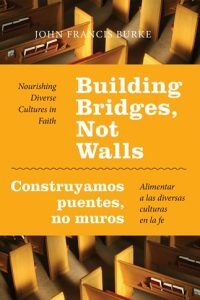 John Francis Burke in his book “Building Bridges, Not Walls” offers pastoral suggestions for how parishes can build inclusive communities where everyone is welcome and all gifts can be used. Burke, who specializes in multicultural and multilingual church choirs, also teaches political science and religious studies in Texas. His focus is mainly on Spanish-speaking immigrants and the problems that occur between them and the English-speaking Catholic community. He begins each chapter with a pastoral scenario focusing on one of the many problems that can occur in a parish when people from different cultural groups come together to worship and live. He then lays out a broad array of information to help the reader understand the historical and cultural differences between these cultures. In writing “Building Bridges” Burke has done his homework. The bibliography is substantial and the citations throughout reflect respected scholarship. Positively, this provides a reader with a wealth of content and solid explanation. Negatively, by covering so many substantive issues in the few pages available to him, Burke tends to simplify issues and arguments so much that one may argue with some of the conclusions reached. While officially 216 pages in length, Building Bridges is actually a more modest work of about 108 pages in English because half the pages are in Spanish. Having the Spanish on the left side of the page and the English on the right makes reading a bit complicated — one naturally wants to continue to the back side of the page — but it is a minor distraction. What’s more of a distraction is that Burke seems, at times, to suggest that the problems in culturally diverse parishes are caused by the failure of the English-speaking community to recognize and respect the gifts and culture of the Spanish-speaking. While this can be (and often is) the reality there also has to be an understanding of what is taking place in the English-speaking community as well. In reality, no specific person or group is responsible for the tensions; they just are. This is where a longer book with a more detailed presentation on the issues would have been beneficial. “Building Bridges” is a welcome addition to the literature on this topic. People working in culturally diverse communities will find here a wealth of valuable information and insight to help them address the underlying issues that they experience working across cultures. Mulhall previously served as the assistant secretary for catechesis and inculturation at the U.S. Conference of Catholic Bishops.